It is generally accepted that ping pong and table tennis are the same thing. This is not actually true. While similar, there are some key differences. Allow me to elaborate. Ping pong is played with ping pong paddles. Table tennis utilizes specialized miniature tennis rackets, which are actually made with a wood surface instead of the webbed surface used on a traditional tennis racket. This wood surface is generally covered with a synthetic surface for superior game play. Ping pong is played with a ping pong ball. These are the same balls used in beer pong. 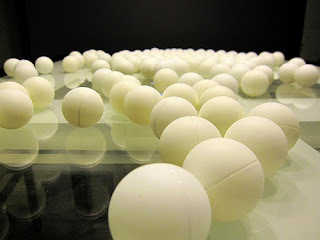 Table tennis is played with miniature tennis balls. Because of their size, they have to be made out of thin plastic. Like traditional tennis balls, they are hollow. Ping pong is played on a ping pong table. Table tennis is played on a miniature suspended tennis court. To accommodate the miniature table tennis balls, the grass surface is generally replaced with a smooth, wood surface. This surface is traditionally painted green with white lines to resemble a tennis court. Finally, the most significant difference between ping pong and table tennis is found in the speed of play. In ping pong, you can expect top players to serve at 56 miles per hour or faster, though speeds exceeding that speed by much are likely to result in damage to the ping pong ball. Table tennis, by comparison, features play at 90 kilometers per hour, sometimes even faster.